I LOVE using natural oils to moisturize my face, body, and lips. I could take the time to make a fancy homemade moisturizer, but I prefer the simplicity of natural oils. They are loaded with naturally occurring vitamins and minerals, without questionable petro-chemicals and parabens so commonly found in commercial moisturizers. And adding an essential oil to my moisturizing oil makes it feel even more luxurious, like I'm at the spa. I love using sweet almond oil on my face, lips, and body to stay moisturized! 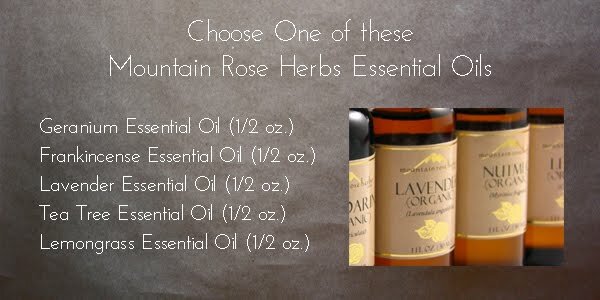 You also get to choose one of the following essential oils! Read here to help you pick which essential oil would be best for your skin type. Essential oils have a myriad of other uses, so you'll be able to use it for more than just your skin! Like Our Homemade Happiness and Mountain Rose Herbs on Facebook. After liking these pages, leave a comment below telling us what your favorite herb or herbal product is and why. Post a link to this giveaway on your Facebook page and leave a comment here letting me know that you did. 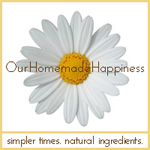 Follow Our Homemade Happiness and Mountain Rose Herbs on Twitter. Tweet a link to this giveaway using tag #giveaway on Twitter and leave a comment here letting me know that you did. Follow Our Homemade Happiness on Pinterest. Pin this giveaway on Pinterest and leave a comment here letting me know that you did. Blog about our giveaway with a link back to this post, and leave a comment here with a link back to your blog post. Giveaway is open to all U.S. residents until Friday, June 29th at 11:59pm PST. Winner will be chosen at random from comments below and will be announced on Saturday, June 30th. Winner will have 72 hours to claim prize or it will be awarded to someone else. Once winner responds, I will pass on his/her email and mailing address to Mountain Rose Herbs and the prize will be sent directly. 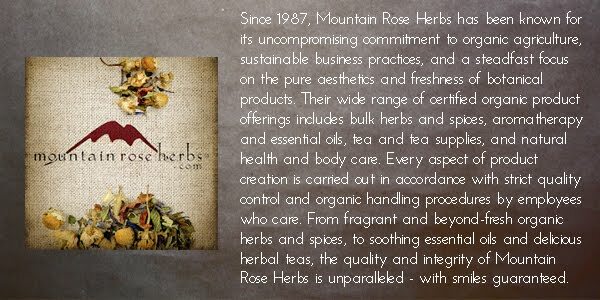 You can learn more about Mountain Rose Herbs at www.mountainroseherbs.com. Our Homemade Happiness and Mountain Rose Herbs are both liked on Facebook! My favorite herbs are Lavendar and Eucalyptus because they are relaxing and soothing. My favorites are lavender and tea tree oil. With those two I have half of a medicine chest! Link posted on my Facebook page, Jam's Corner! I have no idea what my favorites are, because I'm totally new at trying to do things the more natural way! But I'm really wanting to learn and try things, and be healthier in the long run. 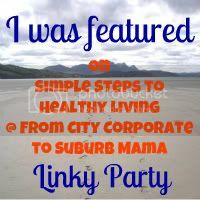 I've shared the giveaway on Facebook and repinned on Pinterest, also! I like both on FB. My favorite herb would have to be pepperment. I love the stuff, especially in my homemade cleaners. I like both on twitter and tweeted. Liked both on Facebook. Shared link on Facebook. Followed on Pinterest! I like the lavender essential oils. It is calming and relaxing. Like both on Facebook!! I think jojoba would be my favorite...new to this and ready to try it!! posted a link to my Facebook page! pinned the giveaway on my Pinterest page! I am new to the world of natural oils, so I have no favorites yet. The sweet almond oil sounds divine! I liked Our Homemade Happiness and Mountain Rose Herbs on Facebook. I relly like essential Lavender oil. We use it at home often. I liked Our Homemade Happiness and Mountain Rose Herbs on Facebook. I love to use natural cleaners with Herbal aromas in them. As well as Bath Oils and Salts made from Herbs. Favorite - peppermint, a bit on the tongue helps so much with heartburn. Follow Our Homemade Happiness and Mountain Rose Herbs on Twitter @JalapenoMama and I tweeted. Lemongrass is my fave because it's calming to the nerves. Liked Our Homemade Happiness and Mountain Rose Herbs on FB! I love the Frankincense essential oil because it's such an ancient & effective healing agent! I like Our Homemade Happiness and Mountain Rose Herbs on Facebook! I have recently been experimenting with herbs and essential oils. Love them all!! Especially peppermint and lavender for relaxation and to help vertigo-like symptoms that I sometimes get. My favorite herb is lavender. I love to use it for aromatherapy purposes, I love to cook with it, and I love to use skincare that has lavender. We have some planted in our backyard so I can have access to it whenever I want. 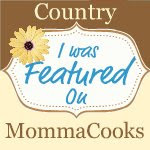 I liked Our Homemade Happiness & Mountain Rose Herbs on Facebook! I liked both on facebook. No particular favorites yet but am going to try coconut oil and shea butter for a diaper cream. I've never tried any essential oils before, but I'd love to try the lavender and the tea tree oils. I "liked" "Our Homemade Happiness" and "Mountain Rose Herbs" on facebook. My favorite Herb is Basil. I love the fresh smell the Essential Oil has and I love the cleaning properties! I Facebooked, I Twittered, and I Pinterested!!! Correction - it would be the Basil Essence I speak of. Liked and love both sites! Favorite herb would be lavender and essential oil would be tea tree. Thanks! Following you on pinterest and linked. Great site! Oh and I posted to fb about the contest don't know how to link that back but it is on my timeline. I like you both on facebook. I'm not sure I have a favorite herb. I do like the way Martha Stewart says herb though. Herb. With an H. It's so fancy sounding. Already like you both! I love Almond Oil, but I also love to work with lavender and coconut oils. Had already liked both on Facebook; pinned contest on Pinterest and Facebook wall; do not have twitter accounts. I am only going to use this one entry because what is for me is for me. I would like to try the coconut oils! My favorite herbs tea and mountain rose herb because they make me feel relaxing! Followed Our Homemade Happiness on Pinterest via name: fiona. Just liked you both on FB. 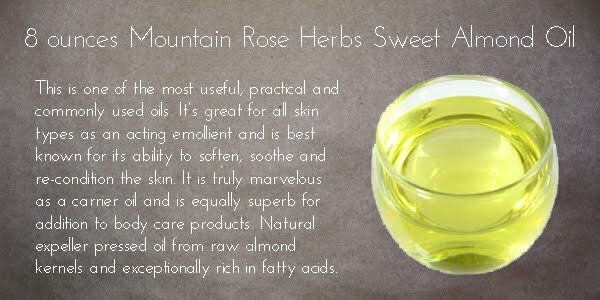 How funny-I just came across your site as I was trying to find homemade lotion recipes before placing my order on the Mountain Rose Herbs website. I have extremely dry skin (we just moved from Florida to southwest Arizona and my skin is hating the extremely hot and dry climate)and want to find something that will really moisturize my skin without all the bad stuff that is added to store bought lotion. just pinned this on Pinterest....I haven't ever used essential oils so I don't currently have a favorite. They all sound wonderful! Lavender is my favorite because it's so relaxing and can be used for so many different things. Thanks everyone for entering my Mountain Rose Herbs giveaway! The lucky winner is Mary! 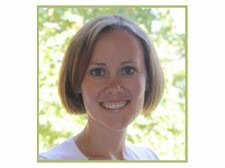 Mary, please email me to let me know which essential oil you want. I also need your shipping address so Mountain Rose Herbs can mail you your prize. Congrats Mary! Hey Lady! I just found your cute blog via the follow fest and I'm your newest adoring follower! 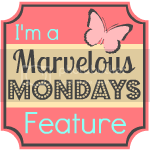 I'd love to have you become my blog friend too! 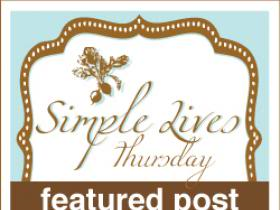 Also I’d love to have you check out a huge Shabby Apple Giveaway I’m having right now!